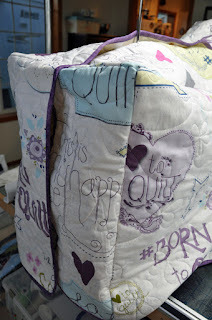 After taking the summer off from sewing, it was time to get back into Doll Quilt Swap mode. My partner lives in Canada and our theme was "Fall". I wanted to do something that incorporated both things. 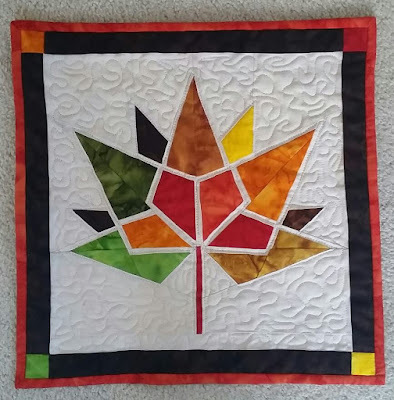 I found a paper pieced pattern from SeaSew based off of Canada's 150th birthday that is happening in 2017. 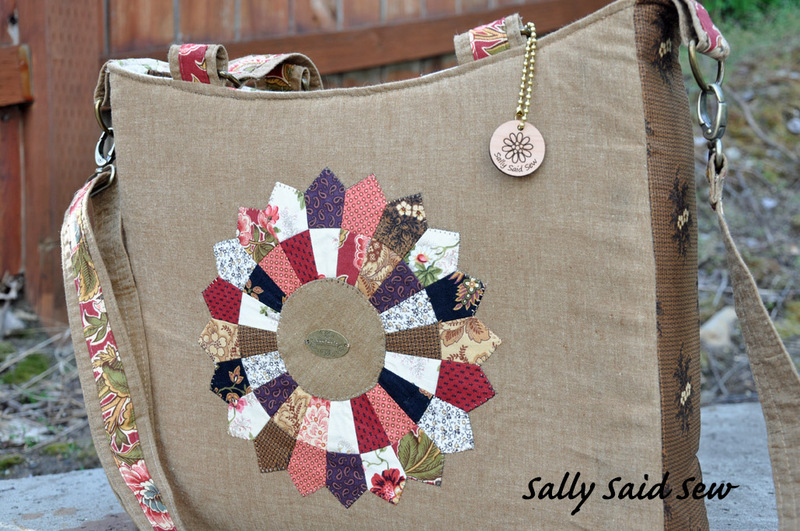 I thought the pattern was kind of pretty, but I wanted to substitute fall colors. 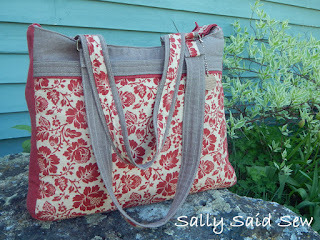 So I did using batik fabrics from my stash. And here is the result. 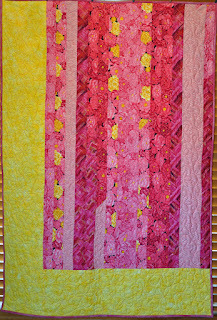 Finished size is 14" 14". 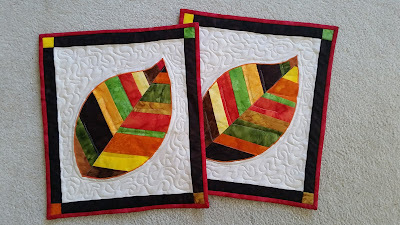 I was so inspired by this little quilt and I had plenty of scraps, so I made two more Fall-themed quilts. 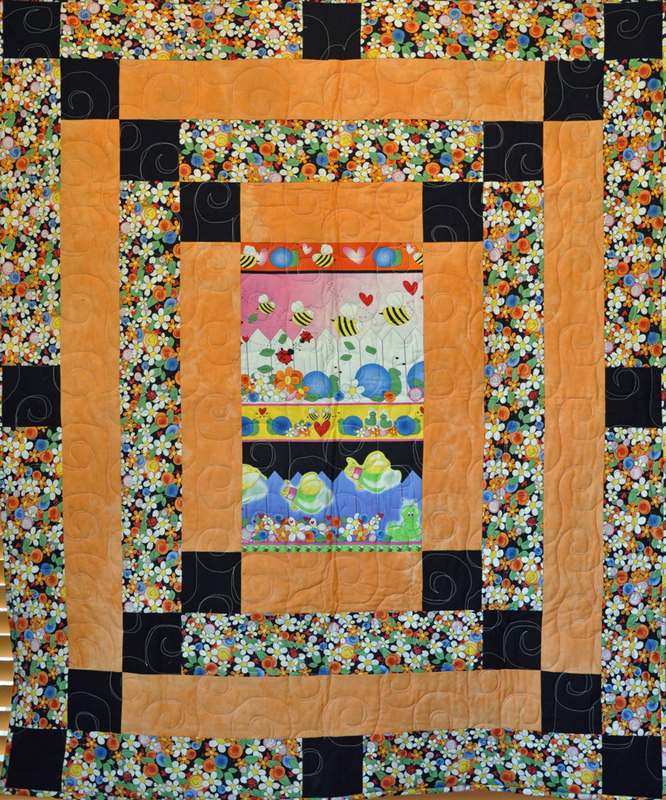 This pattern was from a potholder pattern at Buttons and Butterflies. 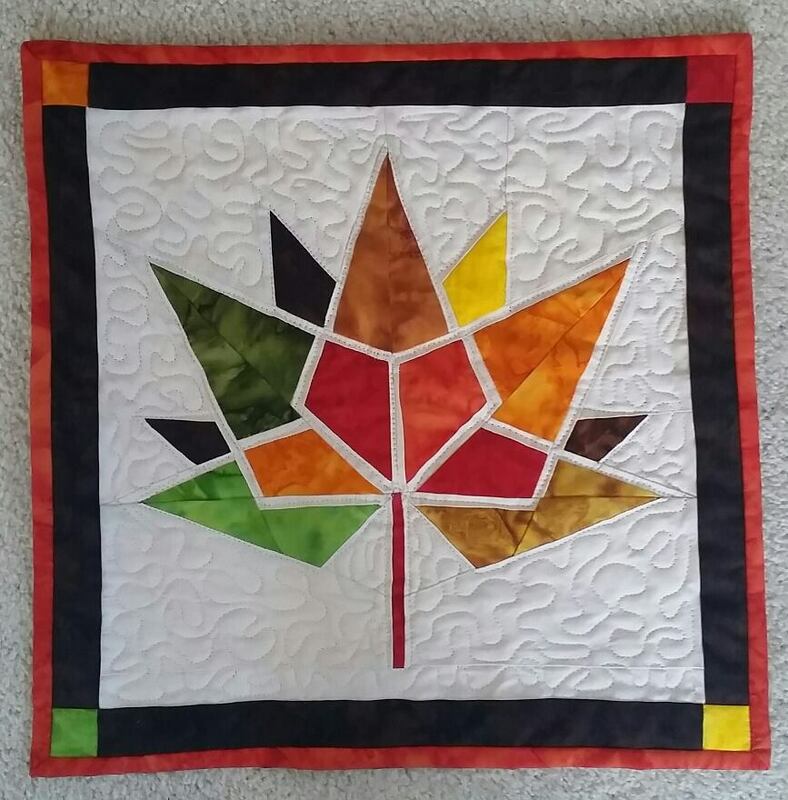 I thought the leaf would make a pretty little mini quilt. It did! 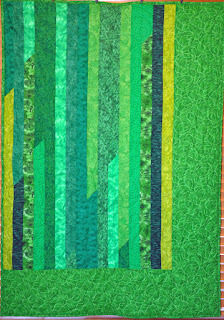 Finished size of these are 13.5" wide x 15.5" high. I kept one for myself and donated the other to the Merc Playhouse in town. At the end of September, they are doing a performance of the The Bedquilt by Dorothy Canfield Fisher. 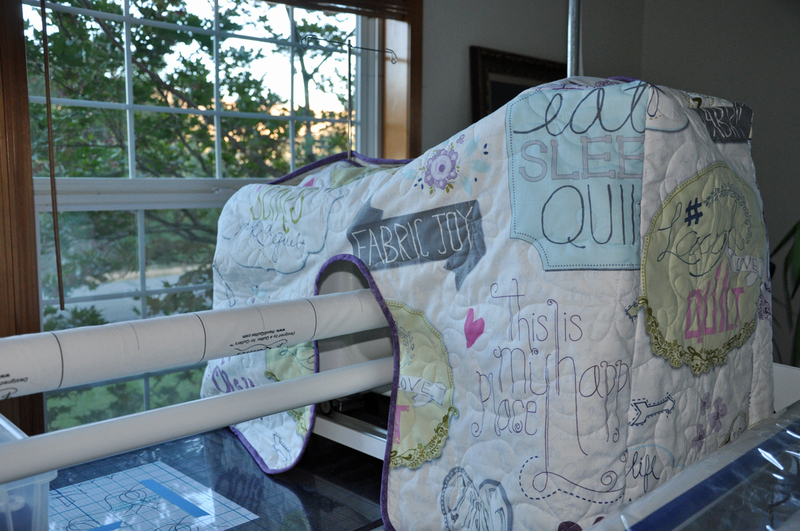 They also have a parade of mini quilts on display for it and theater-goers can vote on the People's Choice Award. 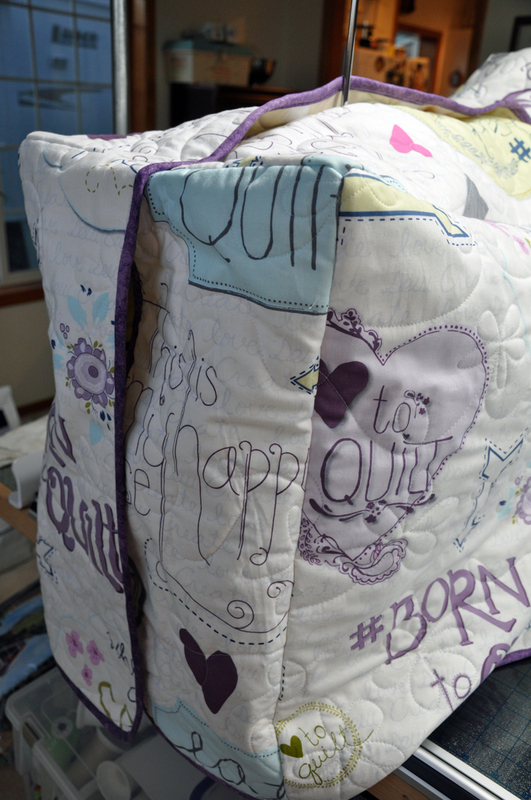 Some of the mini quilts are spectacular (I got a sneak peak). Mine is fairly simple in design so I am quite positive I will not win. I'm okay with that. I didn't do it for a prize. It will be auctioned afterwards. 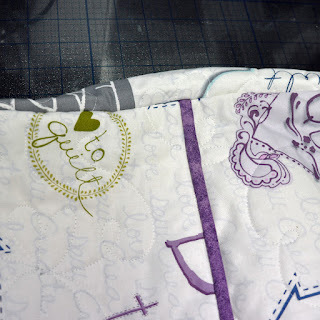 Mini quilts are fast and fun to make! I have been using a sheet as a dust cover on my Handi Quilter HQ16 longarm machine. Not pretty, but it did the job. 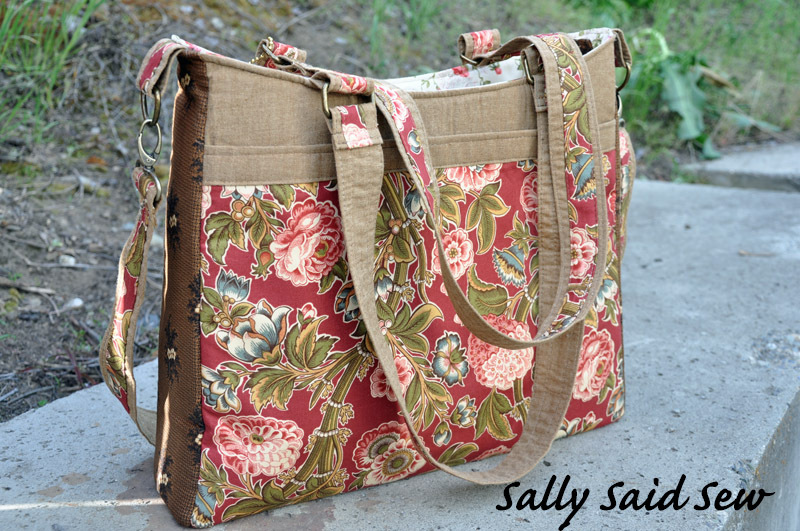 The other day I was shopping at my local quilt store and she had a bolt of fabric that called to me and said, "Hey! I would make a great cover for your longarm machine." 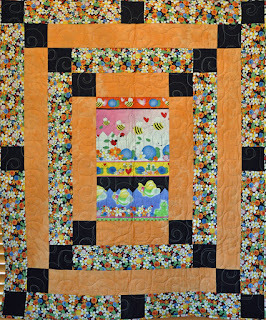 The fabric pattern is called Laugh Love Quilt by Amy Hamberlin for Henry Glass Fabrics. 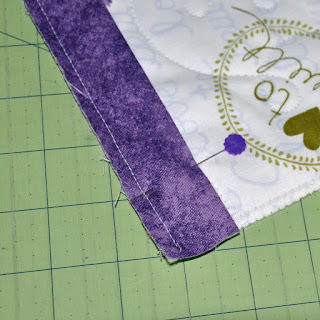 I knew there was a free download pattern on the Handi Quilt website so I checked to see how much yardage I would need before leaving the store. 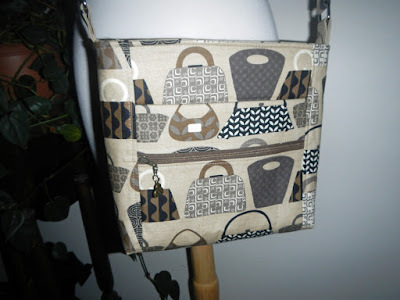 The pattern is for their Avante 18 (they also include info for the Fusion 24). 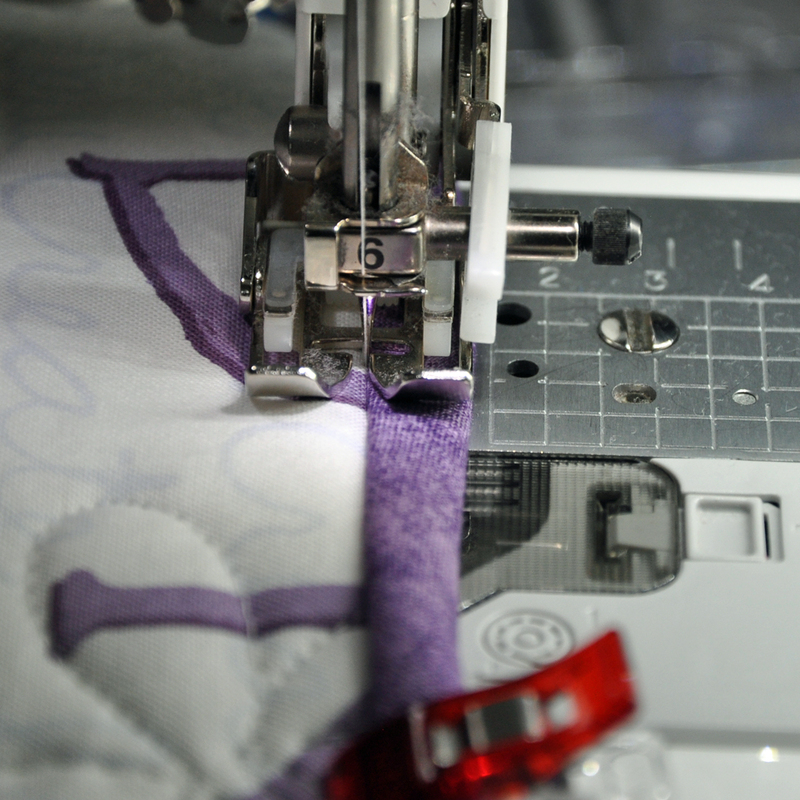 They also include a pattern size if your machine has the Prostitcher--mine does not. The HQ instructions are really brief and not very informative. There are not many pictures of completed covers to give an idea on what the finished product is like. 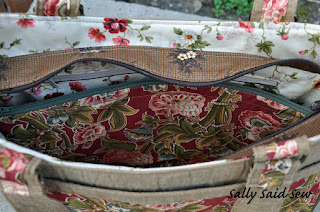 I found a couple of blog posts for the sit down version covers that were somewhat helpful. Otherwise I would be on my own. 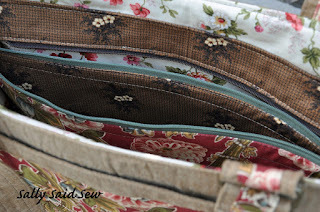 I would need 2-1/2 yards of the main fabric and 2-2/3 yards of a backing fabric (I used inexpensive muslin). 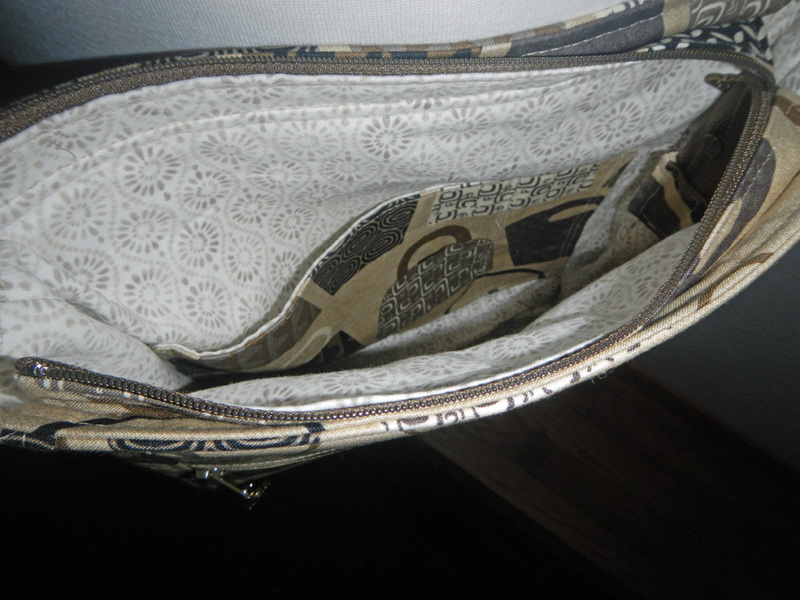 The instructions did not include how much binding fabric I would need. 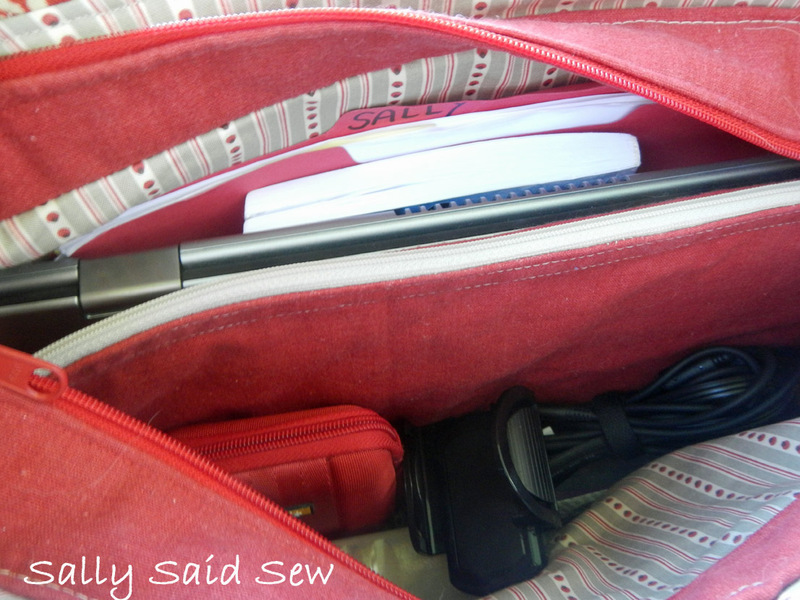 Once I was home I was able to calculate the approximate yardage for binding and pulled the 2/3 yards of fabric from my stash. It took me several hours to adjust the pattern dimensions and modify the instructions. I added additional height (22" overall) so it would cover my carriage. I was mostly pleased with the finished product. It was a bit bigger than I would have liked but does the trick. The Avante 18 is bigger than my HQ16 so no wonder it was a bit baggy for my machine. 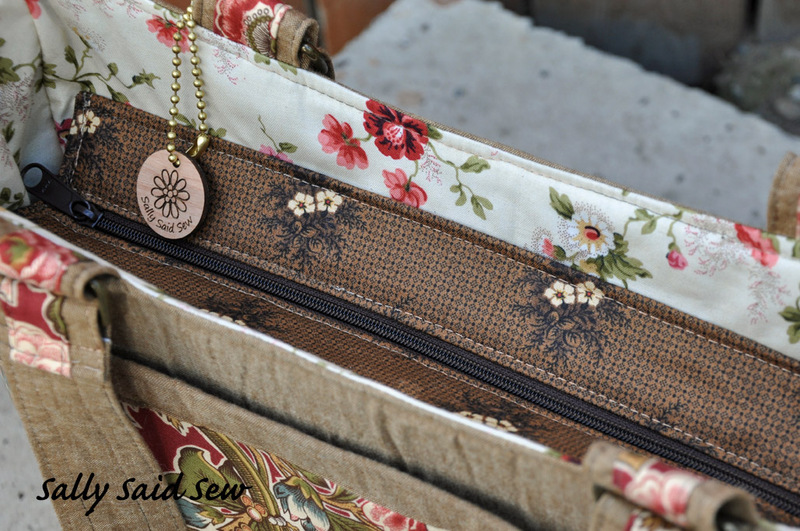 Here is how I made my cover. Note: All seams use ½” seam allowance. 1. 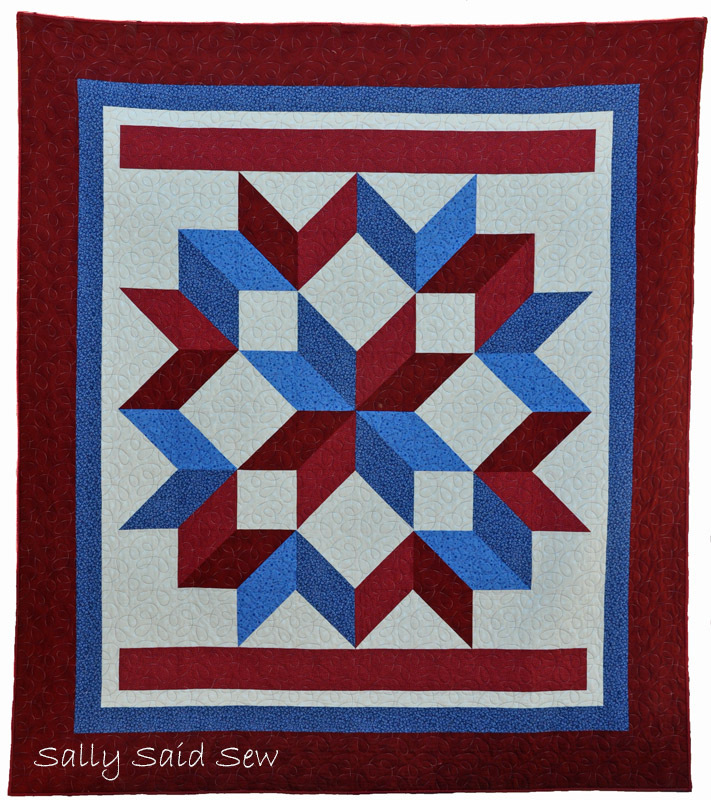 Quilt as desired entire top and backing fabrics on your longarm machine. 2. 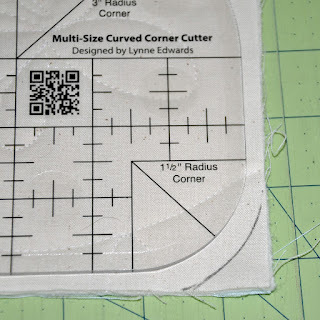 Cut pieces per pattern dimensions. This is set up to allow for directional fabric, but no Prostitcher piece. 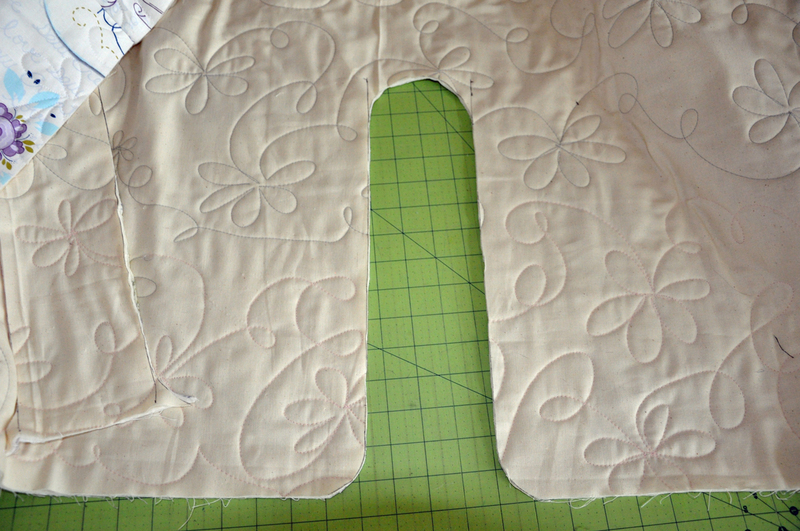 If I had to do it over again, I would make the side pieces a trapezoidal shape so the back is shorter in height than the front. 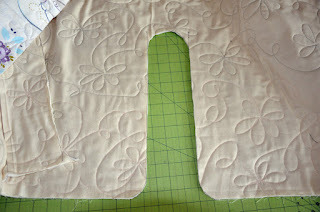 I would like taper the top pieces so the back width is narrower than the front. But it isn't necessary - the cover works if it is shaped as a cube. Adjust side panel pieces to new dimensions. Draw a line from the top down to the back. Adjust back panel pieces to match adjusted back height on side panel. 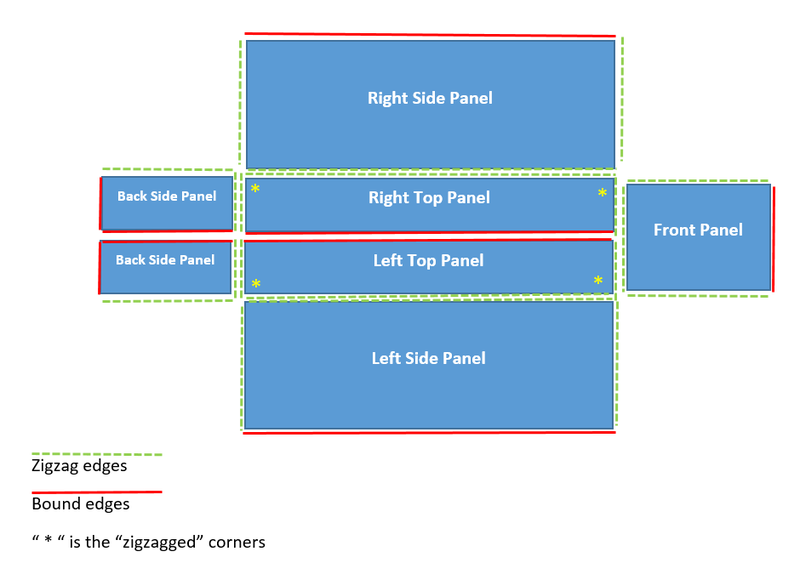 If you adjust the width of the front panel, you will either need to adjust the shape and size of the top side piece for the back to be narrower, or adjust the width of the top side and back pieces to keep more of a cube shape. Add 2” to the adjusted front panel width, and then divide that measurement in half to get the new back panel width dimension. 3. Finish all edges that will not have binding by either using a zigzag stitch or serging. I laid out all of my pieces on the floor and marked the edges that will get binding with a pin. 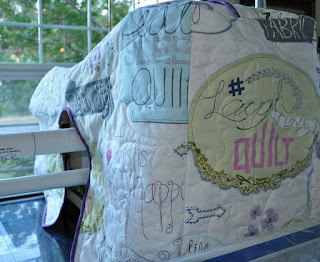 It also helped me to visualize how the pieces would be sewn together. 4. 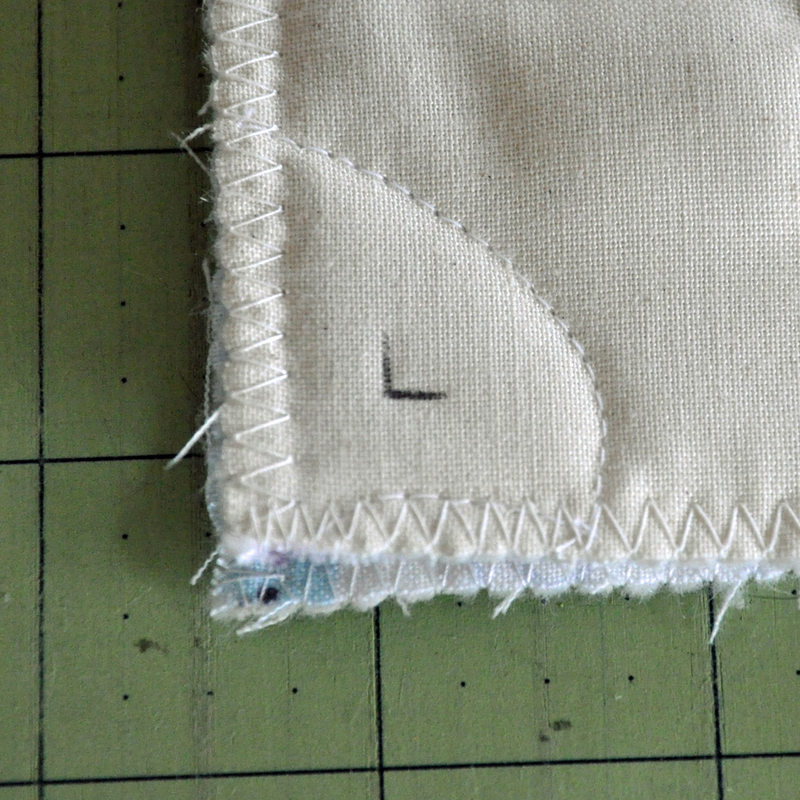 Sew Top Right panel to Right Back Side panel along short edge, stopping and backstitching ½” from “zigzagged” corner. I marked my corners so I could see my stopping points. 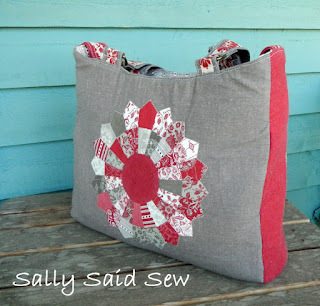 Remember to use ½” seam allowance. 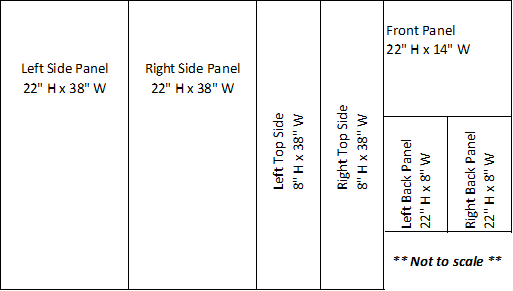 Repeat for left side top and back panel. 5. 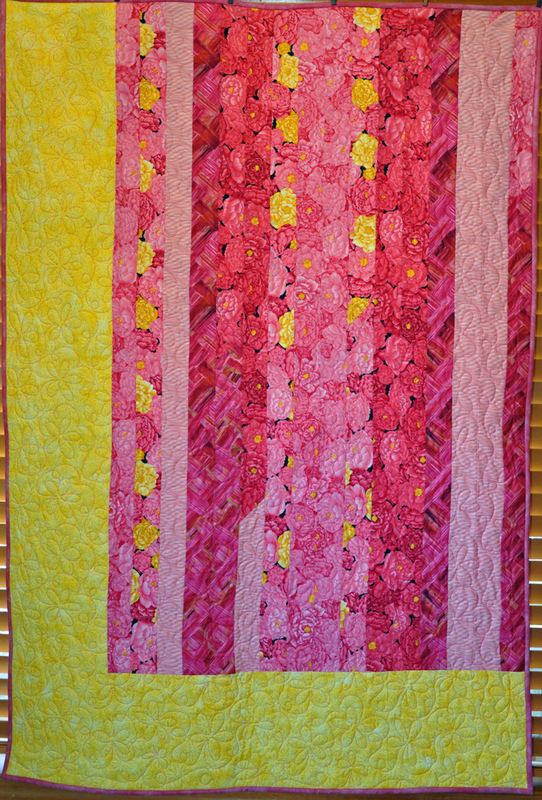 Sew Top Right panel to Right side panel along long edge, stopping and backstitching ½” from “zigzagged” corners. 6. 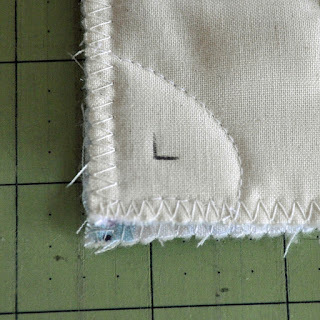 Sew Right Side Panel to back side panel, stopping and backstitching ½” from “zigzagged” corners. 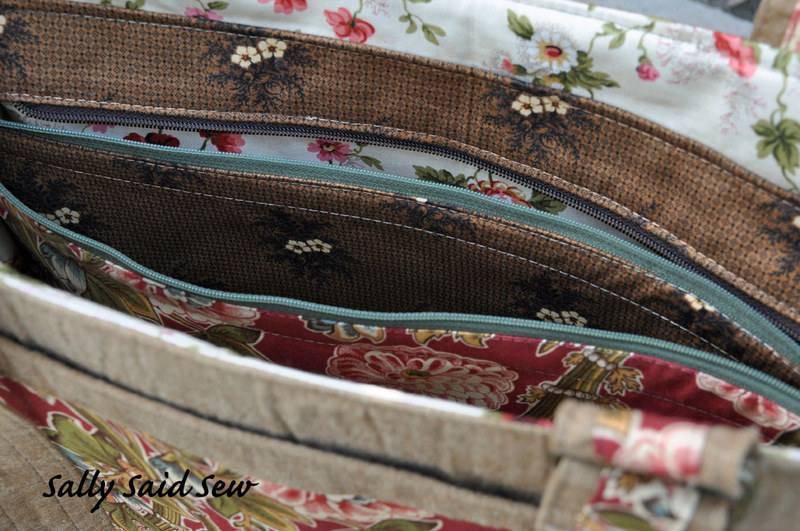 Tip: I flip down the one piece at the corner so I can sew the other seam and not worry about it getting caught. You should now have an actual corner formed where the three pieces come together. 7. 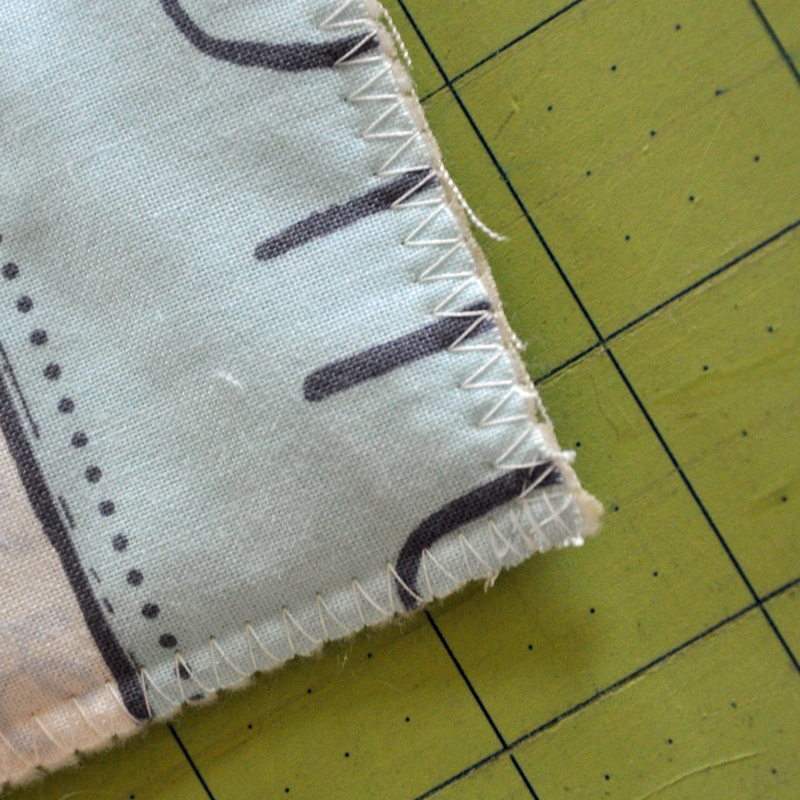 Sew the Right Side panel to the right side of the Front panel (should be the long edge). 8. 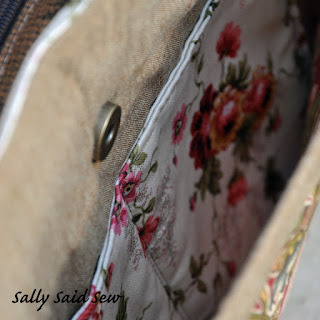 Sew the Left Side panel to the left side of the Front panel. 9. Position your longarm machine where you want it to rest on your table. Measure from the front of your machine to the front side of the take-up bar. 11. Mark another line 4” back from that point. 12. Measure the height of your take-up bar and add 1”. 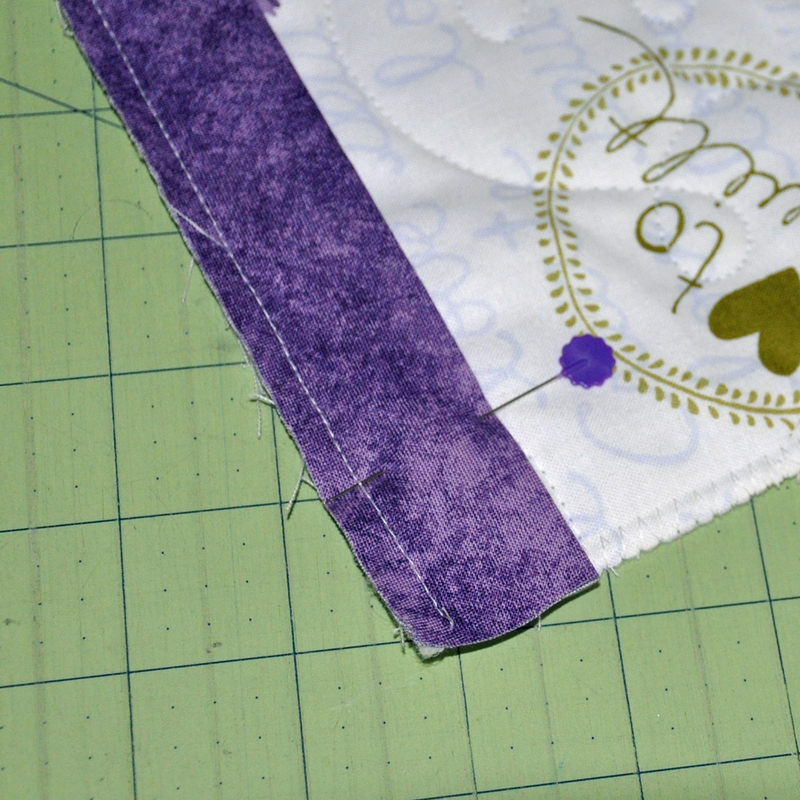 Transfer that dimension to the side panel and mark up from the bottom edge. On mine, my top mark was 15”. 13. 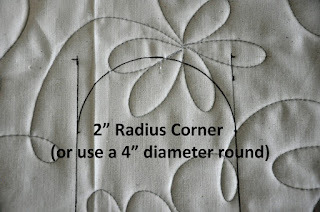 Using the Multi-Size Curved Corner Cutter ruler from Creative Grids, I used the 2” radius corner to draw a half circle at the top of my marks. If you don’t have that ruler, find something that is 4” across and use it to mark the half circle. 14. 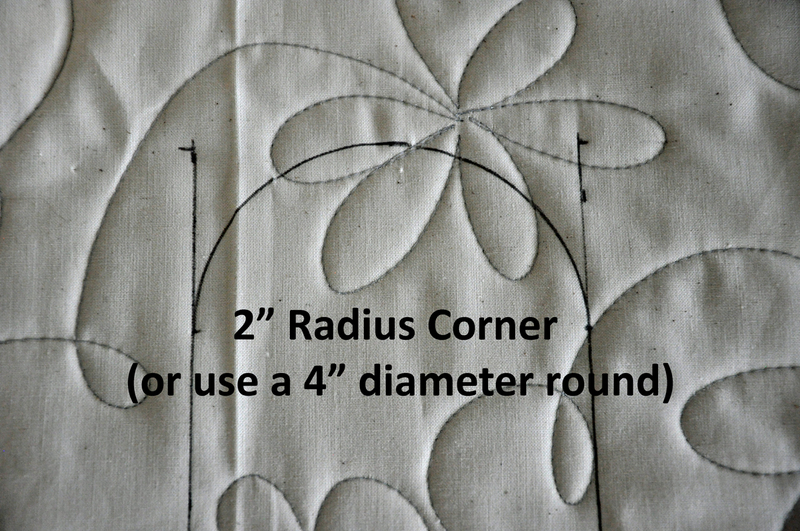 At the bottom edge of the take-up bar area, radius the corners. I used the 1-1/2” corner on my ruler. 15. 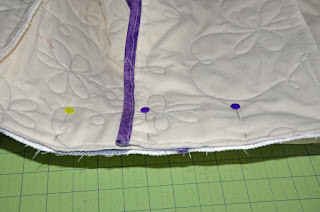 At the bottom edge of back side panel where the binding will go, radius that corner also. 16. Repeat markings for the left side panels. Then cut out both sides. 17. Make bias cut binding using 2-1/2” wide strips. 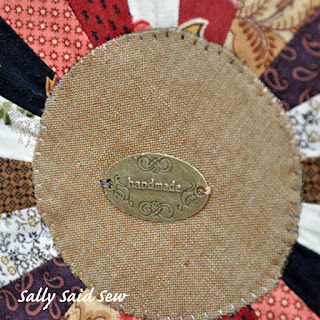 I use the Creative Grids Bias Binding Simplified ruler for mine but use whatever method you prefer. 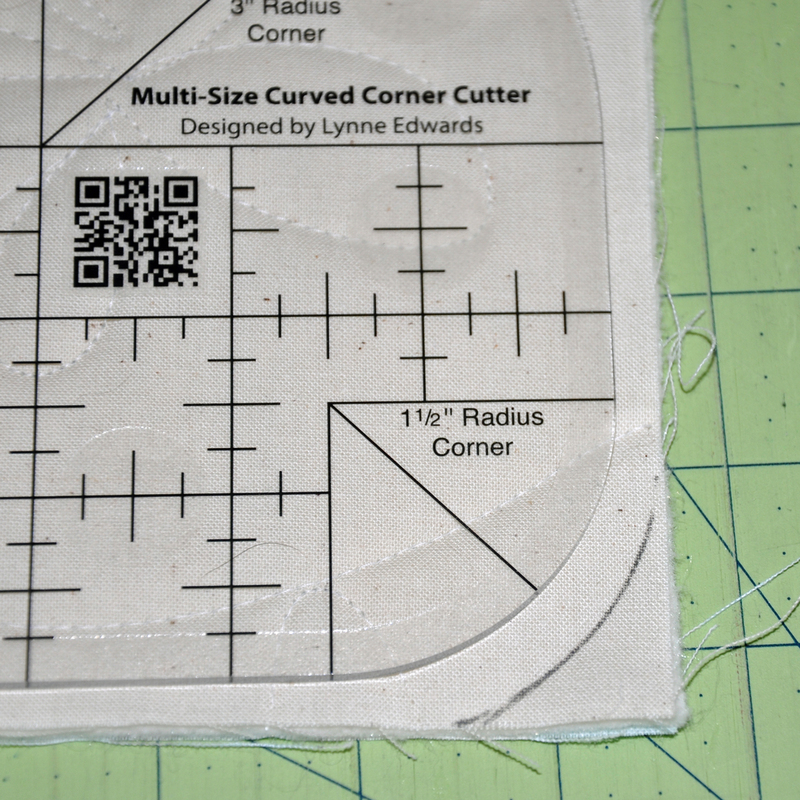 You should use bias cut because of binding the curves for the take-up bar cutouts and radius corners. 18. 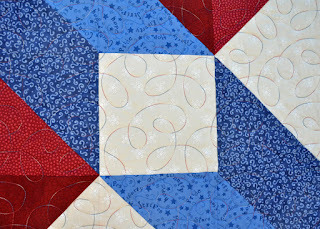 Starting at either the Right or Left Top panel where it will attach to the Front Panel, sew your binding to the front side using 1/4" seam allowance. 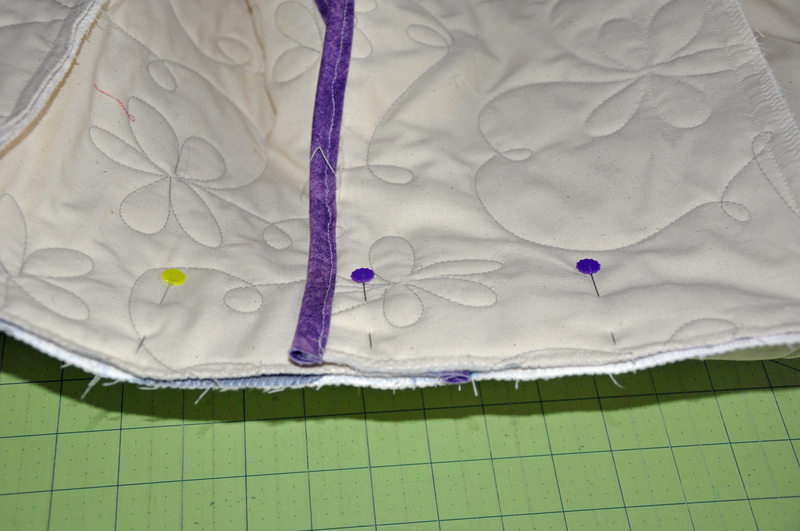 Continue the binding all around the unfinished edges until you get to the opposite Top panel edge. 19. 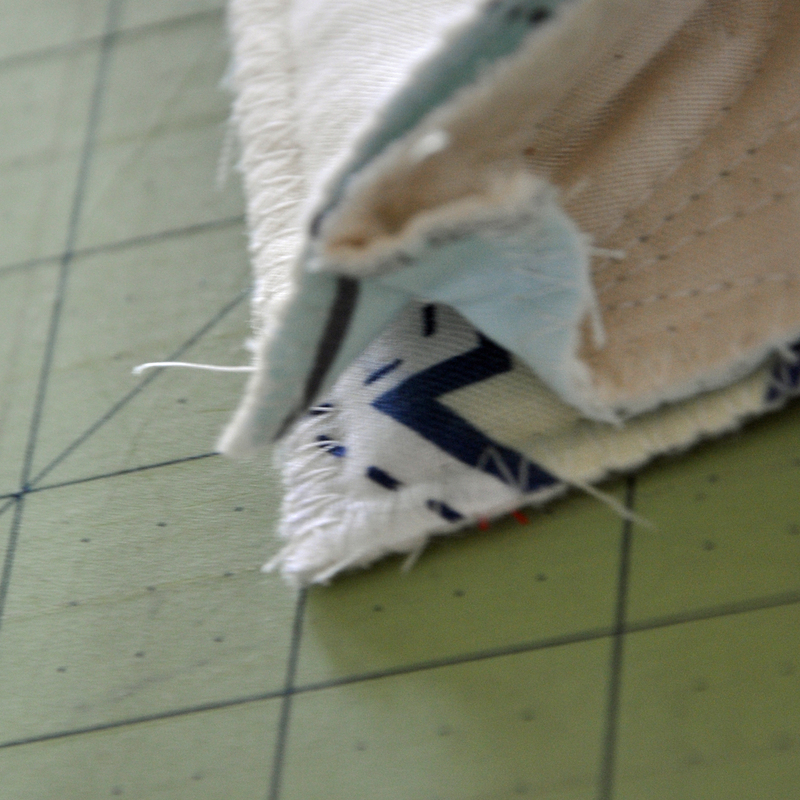 Fold binding to back side of cover and on the front side, stitch-in-the-ditch catching the binding on the underside. 20. Pin the top panel pieces to the front panel piece. The two top panel pieces should overlap about 1” in the center. 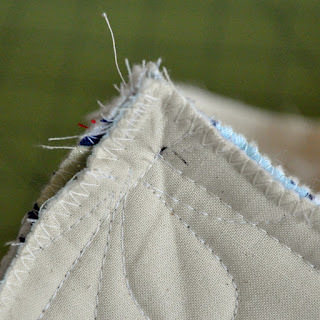 Sew the seam, stopping and backstitching ½” from the two corners. 21. 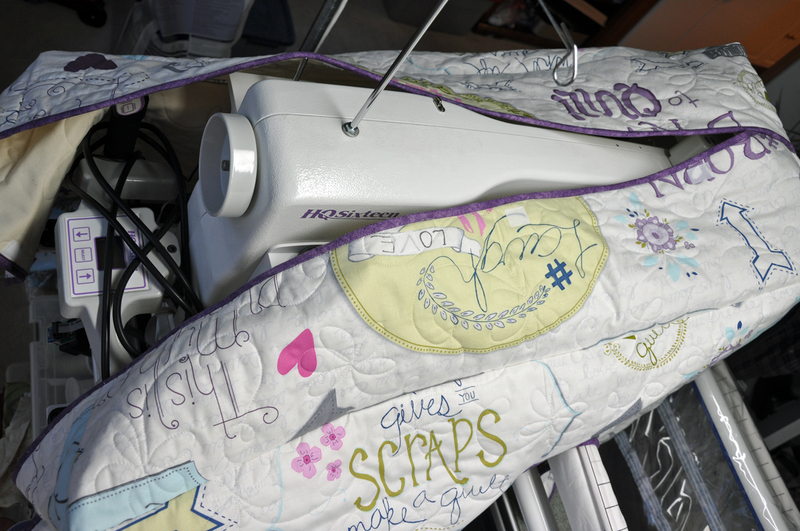 Test fit cover on your longarm machine and decide where you want the hook and loop pieces, especially around the thread mast area. Attach hook and loop pieces to top and back panel pieces. 22. Your new cover is now complete! You can download the instructions here in PDF format. 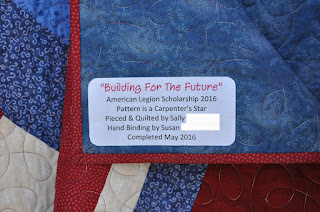 I was commissioned by a group of ladies from our local American Legion to make a quilt for them to raffle off for their scholarship fund. I decided to go with a red/white/blue theme and settled on a Carpenter's Star pattern. 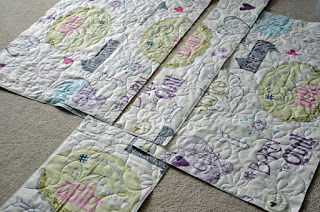 All of the fabrics are good quality quilting fabrics. No cheap stuff here! The batting is an 80/20 blend. 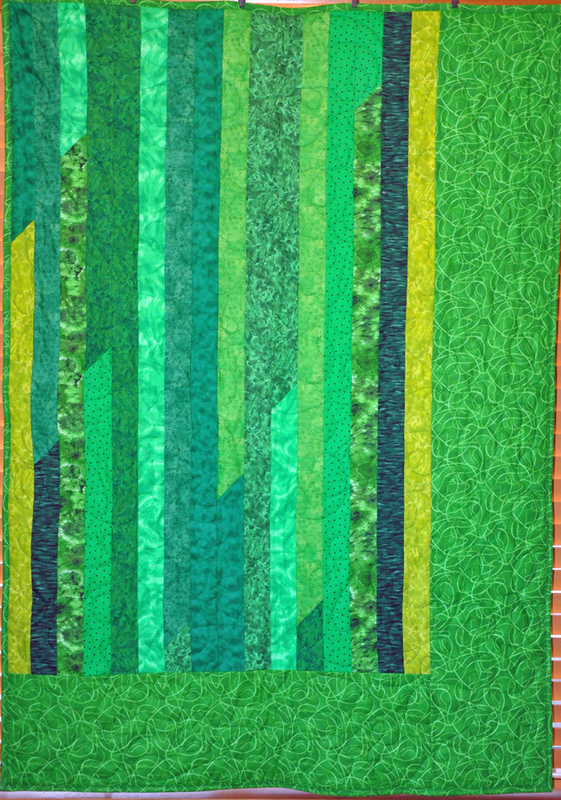 Finished size is approximately 80" x 90". 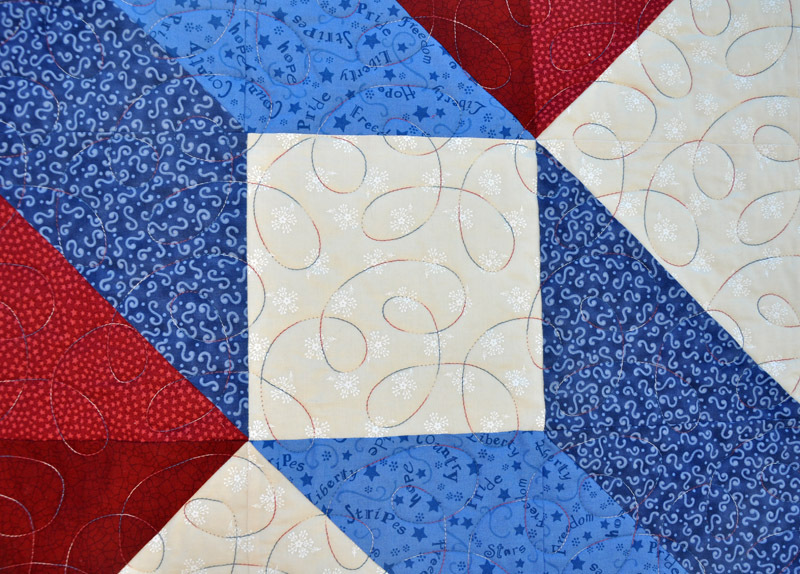 I did an edge-to-edge design and used Superior Thread's King Tut in a variegated red/white/blue color. 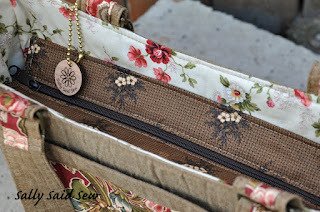 My mother graciously helped by finishing the binding since it is no secret in my house that I do not enjoy hand sewing, although I did sew on the label. 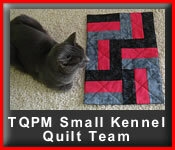 The name of the quilt was inspired by the pattern. 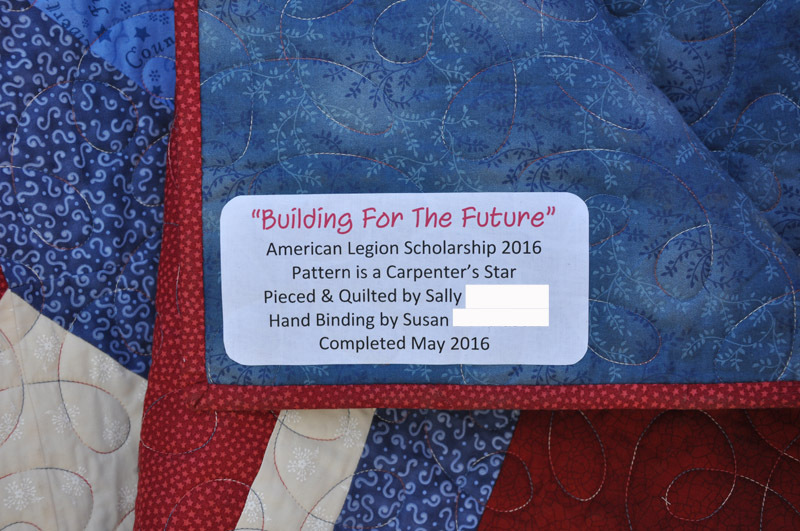 Carpenters are builders, and this quilt will go towards providing funds for some student's future. Tickets will be $1.00 each (so I hope the ladies sell lots of tickets!!). I know I will be buying some in hopes of winning it back. If you are interested in purchasing tickets, email me at sally (at) sallysaidsew (dot) com. I am not exactly sure when the drawing will be - possibly May of next year. I will share more details as I get them. I recently tested the Truffle Tote pattern from Clobird Designs. 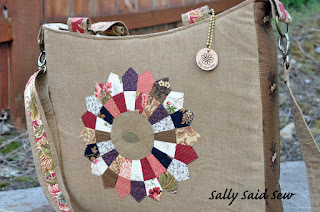 I opted to do a Dresden plate version of the bag because I liked the idea. 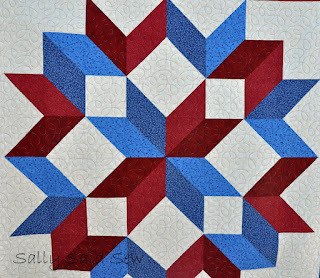 I found a neat Dresden pattern that I scaled down to fit. 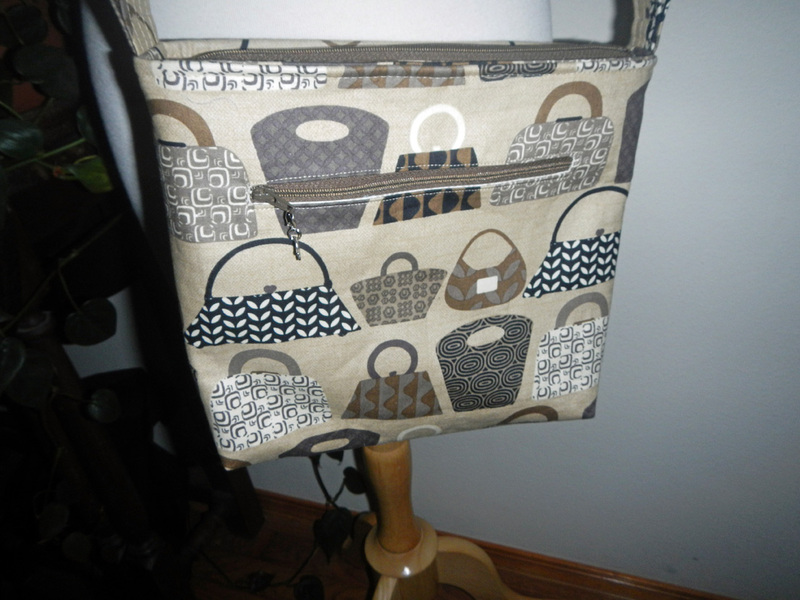 While I wasn't totally pleased with my final product, I did like the functionality of it. I even used it on a trip via airplane and car to carry my laptop and a few other goodies with me. It worked out great. 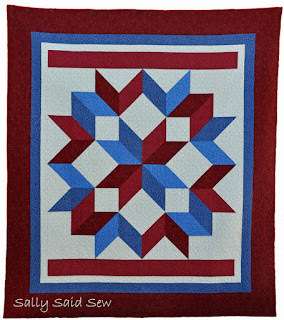 Clobird approached me about making another one to display at the upcoming Spring Quilt Market in Salt Lake City. Why, heck yeah!! Materials were provided and I got to work on it. 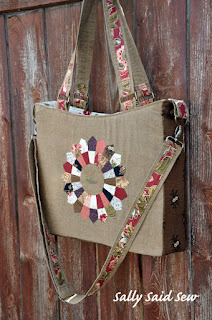 My bag will be in the Andover fabrics booth. All of the fabrics are from Andover including prints from Di Hall-Ford and Kathy Ford, along with a beautiful caramel chambray. 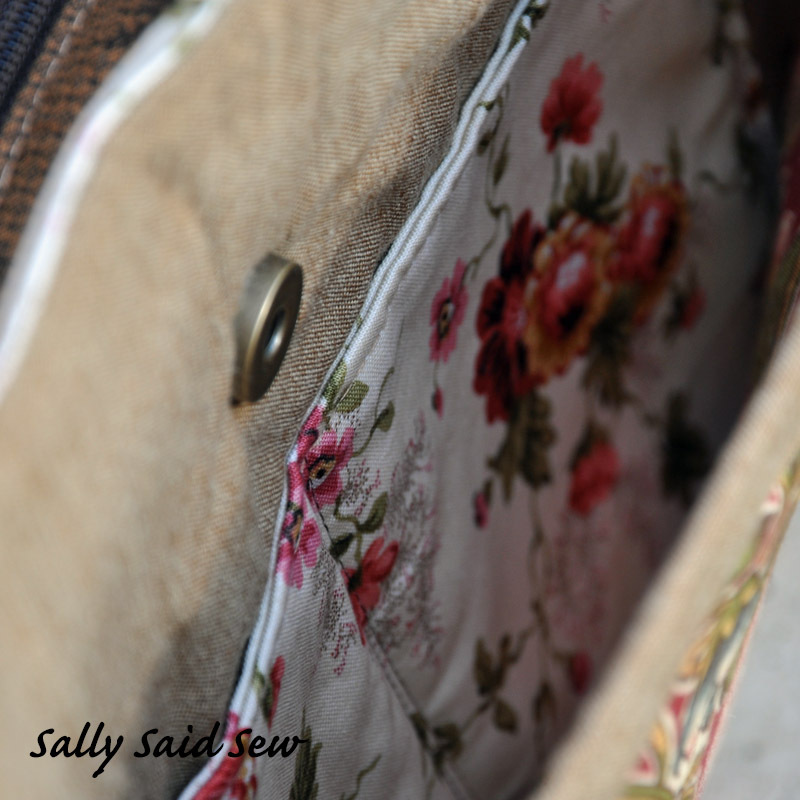 About the only deviation I made from the pattern was to add a layer of Pellon's Flex Foam to the bag bottom to protect my laptop. This time around, I love the finished product. 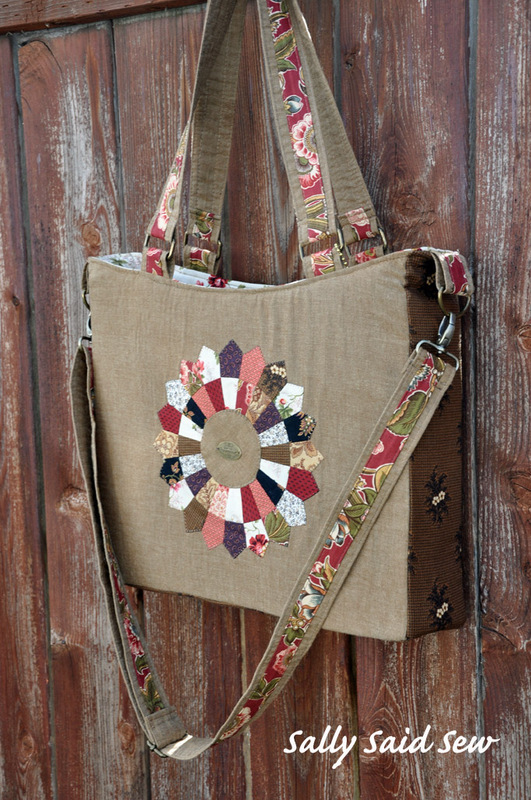 After the show, I will be receiving my bag back and you can bet I will be using it. Thanks, Karis, for the opportunity to show off CloBird!